Youth sports are a lot more competitive and demanding than they used to be. While your child will certainly develop plenty of new skills and character developments through sports, it is important to be aware of any signs of injury, distress and syndromes that come from overactivity, overuse of specific muscles, or just from flat-out exhaustion. When I was growing up, it was common for kids to play three or even four sports over the course of the year: one sport per season. Over time, however, I have gradually observed single sports become year-round activities. Baseball, football, track and soccer move indoors in the winter or to private training facilities; summer training pushes onward for basketball, volleyball and wrestling. Gymnastics, cheer and dance span across all four seasons with practices scheduled up to four nights per week. Being a competitor myself, part of me loves to see youth sports taken more seriously. Young athletes are pushed to accomplish great feats – they throw faster, shoot with more accuracy and learn to dominate in their chosen activity. While this is great for the competitive nature of the youth or teen (not to mention for their parents, too), there are risks involved — risks that may not seem as serious when your athlete is 12, but that come to haunt them at 18 or in their 20s. 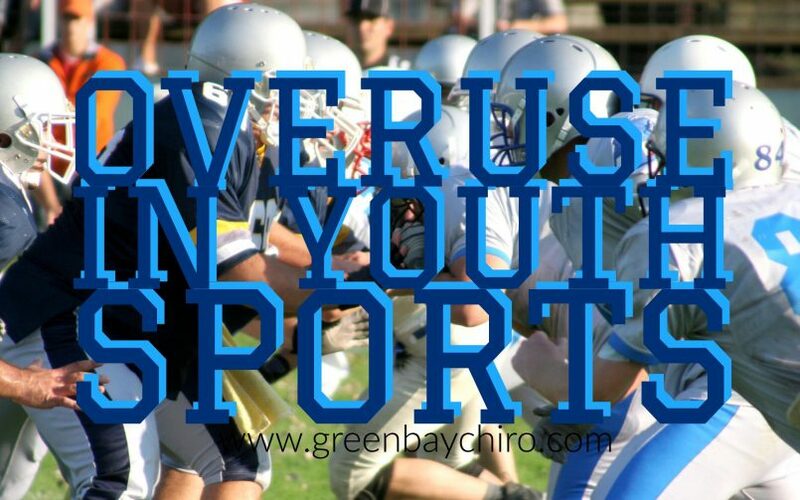 Overuse syndrome is common in athletes who devote all their ability to one sport at an early age and train for that specific sport year round. We sometimes forget that our young all-stars are still young children. Their bodies are still growing and developing. In this crucial time of growth, they are putting tremendous stress on particular joints, tendons, ligaments and muscles depending on their chosen sport. Shoulder injuries are common with pitchers, quarterbacks and volleyball players; hip heel injuries are seen in soccer players, basketball players, and runners. For gymnasts, shoulders and rotator cuffs are quite susceptible for injury and overuse, but so are supportive spine muscles, knees and wrists. Over half of sports medicine injuries in teens and children are due to overuse. Overwhelmingly so, overuse occurs in single-sport athletes who train for a singular sport all year round. Repetitive motions add up, and because their bodies are still developing, they are more prone to injury. However, injuries related to overuse are not always immediately apparent. They can have gradual onsets, or not even fully appear (with much more severity) until in their late teens and 20s. So, what can be done? Be aware if your child expresses any pain or symptoms in specific joints or muscles. Have them checked by a health professional like myself right away. Sometimes, the fix is simple and they can rest and heal. Other times, preventative measures need to be taken or rest periods must be extended. Cross train your athlete. Have him or her perform a variety of exercises, not just the same motions over and over like throwing, kicking, swinging, hitting. Focus on total-body fitness, and even encourage them to play other sports recreationally. Let them pick up other sports even just as fun hobbies – it will help their bodies become in-tune with motions outside of their normal comfort zone and, in turn, strengthen all their muscles. Rest and play are essential. Is it really necessary to wake him or her up on a Sunday to pitch with you? Or to go to a private lesson on their nights off? Well, no, not all the time. Try and create a balance of rest, fun and disciplined practice. Kids need time to just be a kid; hanging out with friends, sleeping in and having fun are all parts of development that your child still needs to experience. If they don’t, they are prone to exhaustion and burnout, both mentally and physically. Have them checked regularly by their chiropractor to catch any conditions early or to learn new exercises. In this stage of their life, structural health and stability is essential to proper growth and ensuring they reach their full potential, both in athletics and in life. If you have any questions about specific sports injuries in your child (or yourself! ), call 920-499-3333 or stop in. I’d love to meet you and your athlete and discuss preventative actions, rest strategies or general exercise routines that can really help offset overuse syndromes and maximize athletic ability.